The conception of a great and universal Sky Father has been part of the collective unconscious since before the advent of mankind. It is a basic intuitive knowledge that appears in some form in the mythology of all the races of man. In a distorted form it even appears in the Judeo-Christian mythology. A Great Sky Father who seeds the universe with life. 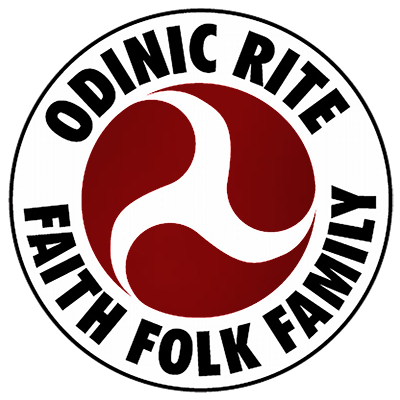 In many books written about our northern mythology, even in some that are sympathetic to our Odinic ideals, the concept of the Sky Father is treated in a very strange way. He is not seen as a great and real power but as a mere “title” held by by one or another of the gods of our race. We are told that at one time Tiwaz was the Sky Father but that he “lost his title”. This was taken over by the other gods in turn and is presently held by Odin himself. In our opinion this is another example of treating the gods in a “literary” way as mere fictional characters. The writers are caught in the trap of Judeo-Christian materialism and cannot see beyond the words of the myths to achieve a realisation that the gods they write about are not mere figments but transcendent reality. Through research, meditation and a resulting mystical insight we have come to the realisation that the Great Sky Father, as represented in our ancient mythology, is that being, the “First Mighty One”, whom our ancestors called Buri. It is difficult to come to the knowledge of this wonderful and vital being without to some extent using the symbolism of human shape. In our new creation myth we picture him, using another ancient archetypal theme, as loving and coupling with a young and maiden Earth. From their union, on both a spiritual and material level, came the gods of the Earth and the great stream of Earth life that ever diversifies according to their Will. We can see that within the stream of life there is a basic kinship, a unity in diversity. In our appreciation of the Sky Father we can extend this concept. We can understand that in a very real sense the stream of life flows through the universe, that we are kin to all life throughout the galaxies, that some part of our inheritance lies in the vastness of outer space.